Is there a way to sync the meals list between both my device? Mario, thank you for your question. 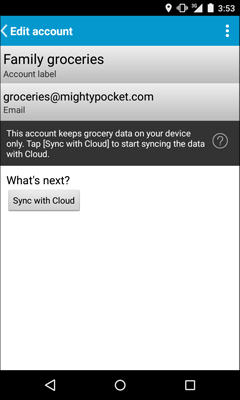 Unfortunately, there is no way to sync meals instantly, but we plan to add this feature in the near future. In the meantime it is only possible to transfer meals by creating backup on one handset and then restoring backup on another device. If “Mighty Grocery” developed for the iPad? If so, when can we expect? Patrick, thanks for your question. 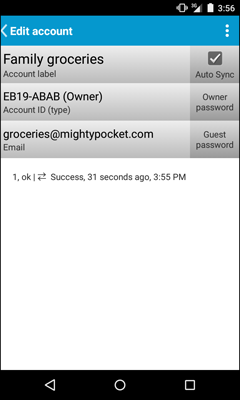 Yes, we develop Mighty Grocery for iOS. It’s now the top priority. So I hope the iOS version of the app will be available soon. the description of accounts suggests, that there may be several accounts (one owner and several guest accounts). What is the sense? If I live in several familys at the same time… ? I added one account and chose a guest and a different owner password. Tapping the “+”-sign lets me log-in and reset password, but not add another account… So how to do this? Where can I log-off and where can see whether logged-in or not? What is the meaning of the check-mark infront of the account? Hi Rudiger, thanks for your feedback. Basically difference between Owner and Guest accounts is that Guests cannot push lists. We recommend using Owner access only if you don’t see the reason for having Guest account or multiple Guest accounts. > I added one account and chose a guest and a different owner password. Tapping the “+”-sign lets me log-in and reset password, but not add another account… So how to do this? You can sign in to account created by someone else. We don’t provide an easy way of creating multiple accounts on a single handset. > Where can I log-off and where can see whether logged-in or not? Menu > Settings > Accounts contains the list of account(s) you are signed in. To sign out just long tap an account and choose “Sign out”. > What is the meaning of the check-mark infront of the account? 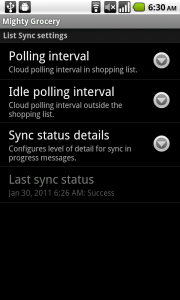 This is the “Auto Sync” setting of an account. I.e. changes will sync instantly if the check is ON. Deborah, thank you for your feedback. We are working to bring Mighty Grocery to iPad as soon as possible. Thank you for your patience and cooperation! Is there any way to export/Import a list to and from Excel? Hi Pablo, you can send your shopping list via email under List tab > Menu > Share > select email app > Send. You can import product catalog under Menu > Settings > Pick list > Side menu > Import. Please see Configure Pick list User’s Guide for more details. Is there a way to sync my recipes between my android phone and my tablet? Lauren, unfortunately there is no way to sync recipes between handsets, but you may want to create backup on your primary device and then restore backup on your secondary handset in order to transfer recipes. We plan to allow instant sync of recipes going forward. You know I LOVE the app! I am wondering how I can share my database with someone else… not just lists. My mother is finally ready to make her lists on her tablet. However, she doesn’t have the patience to input the data I have for the last two years. Is there a way for her to purchase her own app (of course) but copy my ‘backup’ data into her account? We live in the same town and shop at most of the same stores, but allowing her to access my account as a guest probably wouldn’t work well for her. Monica, thanks for your feedback! Yes, you can use your backup on another phone. Just log in to your account from the other phone and restore backup. If you don’t want to share lists with that phone going forward, just go to Menu > Settings > Accounts > long-tap your account > Delete. (make sure that you keep the account on cloud). Recently everything that I add to my main grocery list goes into the “soups” aisle…even though I put in the proper aisle…they are all save in the “soups” aisle. I’ve tried backing it up to see if that will correct the issue, but it didn’t work. This is VERY frustrating, as I face this w/EVERY new entry. Please advise. Vickie, did you ever get an answer – I’m going through the same thing. Just need clarification: if i want to make some major text editing changes to some of my lists, favorites items, and i don’t want to do it on my android device because of it’s small keyboard, it’s possible for me to make the editing changes via ‘My Mighty Grocery’ web UI, but then i have to then 1)delete all the lists on my android device, and then 2)Pull the lists from the cloud to my device? Is that correct? 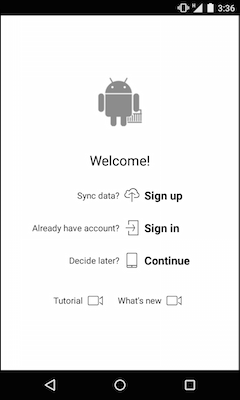 Changes made via the Web UI don’t automatically sync to my android device? MrB, if you’d like to make changes using the WebUI, you just need to push lists to cloud and make changes. All changes will automatically transfer to your handset. 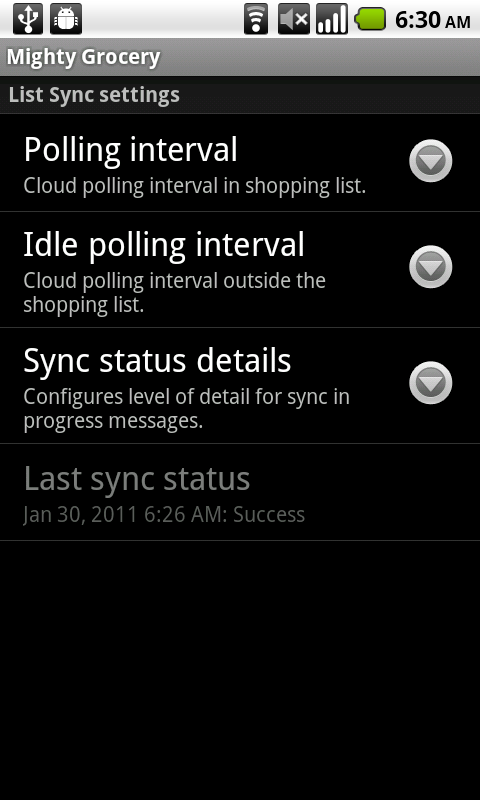 “Pull list” will come handy when you need to sync shopping lists with another handset. what do I have to do to get the photos of my grocery ittems to show up in my gallery so I can view them on my list? They are in my cloud drive on Amazon. Valerie, unfortunately there are differences in Gallery app on Android handsets. As a general recommendation, you may want to try copying you photos to your phone in sdcard/DCIM/Camera folder.